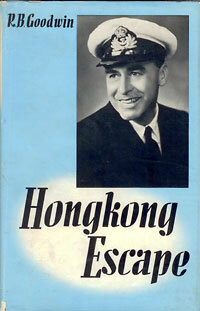 Completing the ‘Editions’ part of an entry in my Khaki Literature bibliography – for Lieutenant-Commander Goodwin’s Hong Kong Escape – I searched abebooks.com in the hope of seeing an image of its paperback edition listed. The original publisher, Arthur Barker of London had an imprint named Dragon, judging by the genre of the (surprisingly) few listed on ABE I get the impression it was more pulp fiction than a literary imprint, and not just in paperback either, as I discovered. Like both of Goodwin’s books, other Arthur Barker best-selling titles would be put out to pasture as Dragon paperbacks I guess, it makes good sense, but it does make a curious scene: a rack of Dragon paperbacks in a booksellers cubby on any given railway platform in the U.K. during the 1950s; murder, mystery, sci-fi and promise of mayhem; among them, fresh-faced pre POW Lieutenant-Commander Goodwin. I didn’t find an image of Hong Kong Escape in Dragon Paperback, I would like to see the ‘pulp’ version though, how dark could fresh-faced Goodwin go? Both Goodwin’s books are rollicking tales, and are among the best and most exciting of true escape stories. Assuming Dragon was an imprint with a distinct genre, Hong Kong Escape would have been quite capable of competing with its racier neighbours in the Dragon rack. While Hong Kong Escape come to Dragon after at least five hard-back impressions, it should not have surprised me to see that the best of the Dragon imprint – which I had assumed was paper-back only – was put back-into-hard-back. 1st Printing c1954, near fine, in the rare dust-jacket. …reportedly, a paperback version of this book sold for $1000, I expect that I will never see another copy in my bookselling lifetime. This is a long way from an entry in my bibliography covering New Zealand World War II books, I know, and usually on a Sunday afternoon working on Khaki Literature I would keep these thoughts to myself… it’s just an amazing book, an amazing price. A pulp surprise. By the way Leonard also has a copy of Passport to Eternity available, Lieutenant-Commander Goodwin’s follow-up to Hong Kong Escape at a more modest US$11.88. 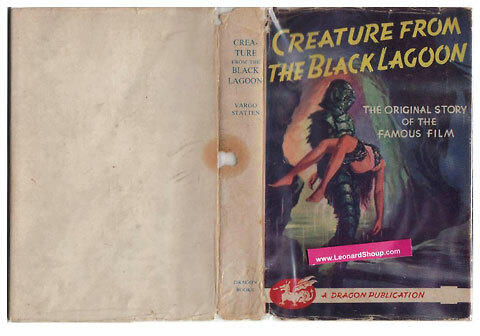 This entry was posted in Books, Bookshops & Libraries and tagged $6500 book, book-shops, bookshops as research tool, Creature from the Black Lagoon, distractions, Dragon paper-backs, Leonard Shoup Books Canada, rare books. Bookmark the permalink.